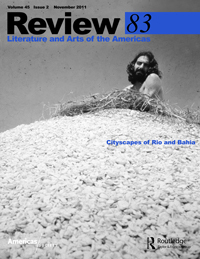 Review 83 - "Cityscapes of Rio and Bahia." Review 83 features articles by leading scholars—including the guest editors above as well as Earl E. Fitz, Charles A. Perrone, Cecilia Rêgo, and Nelson H. Vieira—on a breadth of topics relating to literature from Rio de Janeiro and Bahia (Salvador). The issue also showcases fiction, poetry, song lyrics, and essays by the participating writers above as well as Chico Buarque, Dorival Caymmi, Jonatas Conceição, Sonia Coutinho, Gregório de Matos, Vinícius de Moraes, Carlos Drummond de Andrade, João Ubaldo Ribeiro and others. The issue features arts pieces on the current Americas Society exhibition Antonio Manuel: I Want to Act, Not Represent!, an essay on ecclesiastical music during the Vargas regime, and book reviews of recent titles in translation. Learn more or purchase Review 83. Subscribe to the magazine.